Harrods for Ladies who race. Harrods will always be one of my favourite places to drift through in London. There is always something to captivate on every visit and I often liken it to going to the near-by V&A except the wonderful things here, many works of great craftsmanship are actually for sale. In the run-up to the flat racing season and feature race events in the social calendar such as The Derby, Ascot and Glorious Goodwood later in the Summer, Harrods have shown that they are not settling for second best in the society fashion stakes. I've never mentioned Harrods to much do far on A Blush of Rose but I'd like to tell readers who don't pass through it's halls too often that it's bang up to date. It's not the fusty store that older generations of your family my have known. There's a very committed fashion team that keep tradition and the tradition of elegance alive with renewed energy and vigour. 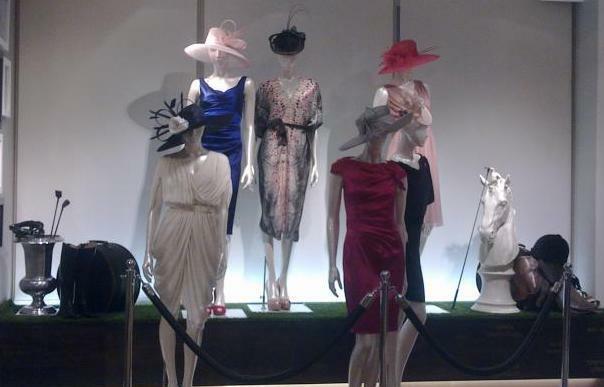 Any how I was very struck by the image of suited ladies in fine hats from Philip Treacy and Stephen Jones that greeted me at the top of the west escalator from ground floor to First. Ascot are making a push this year with their dress code enforcement. Beware all those who dare to bare a little too much in the wrong place at the wrong time, you may find yourself being gently - if firmly - wrapped in a pashmina (not guaranteed to coordinate). One thing off the menu that was acceptable in years past in the way of head gear is the fascinator. A small crown covered with feathers or even an headband with 'furnishings' is no longer considered millinery. I think Harrods impresses on the sheer volume of formal wear that looks bang up to date across a miriad spectrum of colours and designer Labels. You can work many themes, go Chanel, Dior or Valentino or choose a smaller independent label. 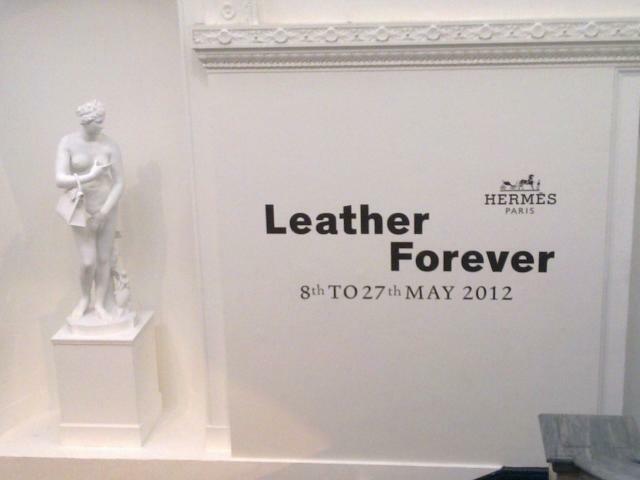 After being at Ascot's 300th anniversary last year I'm looking forward again the racing season and also attended the Leather Forever Hermes exhibition at Burlington Arcade in Mayfair, London. 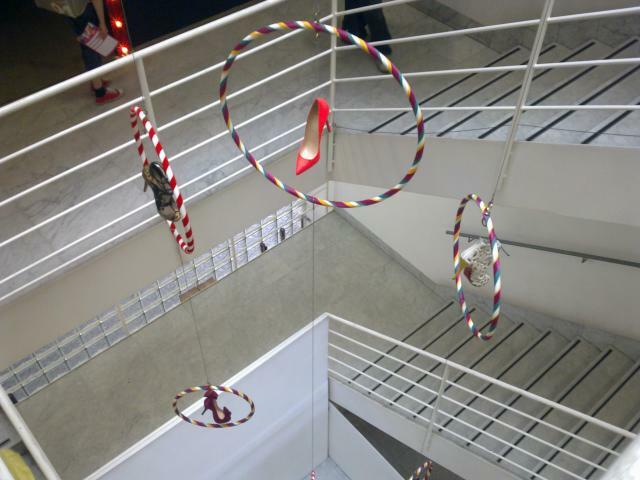 It was wonderful to see a retrospective that also showed the traditional craftsmanship that went onto several of the well known designs from the Hermes Stables. The exhibition really made a strong statement about Hermes deep routes in the equine world. Showcasing their attention to detail in the early harnesses and bridals that developed sympathetic treatment of liveried Horses in France establishes them to a younger new generation as not just a fashion name but also as a part of racing and equine sport in the last 200 years. I really enjoyed the look back at the history of different bags. My two favourites from the back catalogue would probably be the Market Back, a simple bag sometimes known as a Champagne Flute Carrier and the variation of the traditional equine Nose Bag for Horse Feed. I think the Birkin is a fine bag and many women crave them, alas I don’t aspire to join their company. I do think the lady herself, Jean Birkin along with Princess Grace of Monaco who also inspired a classic, where goddesses of the brand. My tastes are more simple and old fashioned, and equine. I'm more than satisfied with my look into the archive of wonders from Hermes. It's also wonderful to see a brand still owned by it's founding family. 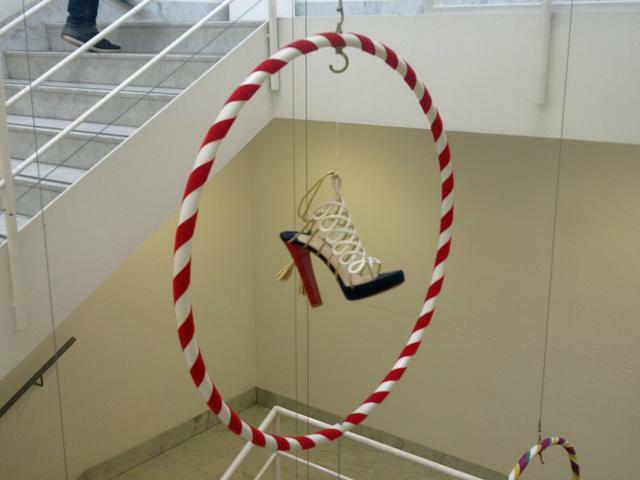 Christian Louboutin - London Musuem of Design. 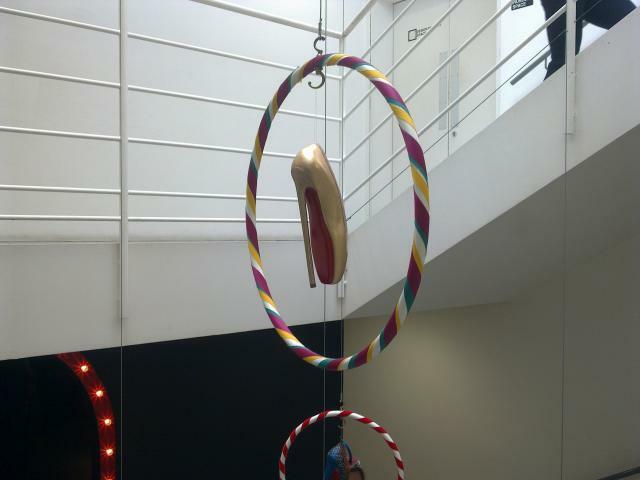 I went to the Christian Louboutin Exhibition with my very talented graphic designer friend Florine to see this seminal work by one of fashion's most pivotal Shoe Designers. This is a great venue. 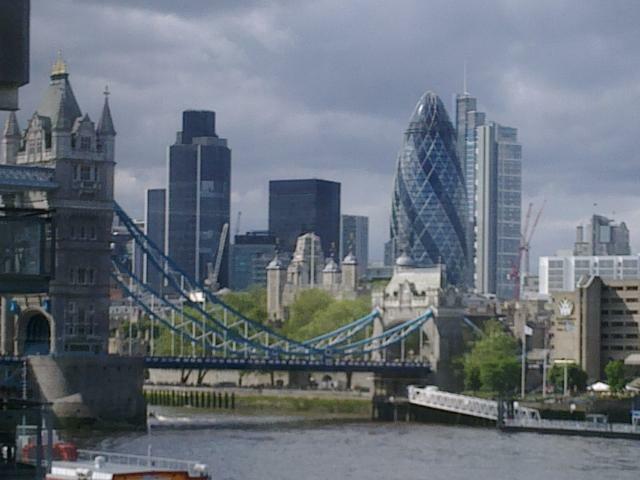 Sitting up at the mouth of Thames it sit's at a gateway to the heart of the capital. All images on this page (C) Angela Cliffe. Behind the public image of our Monarch Queen Elizabeth II one woman has taken a leading role in defining the wardrobe and sartorial imprint that Her Majesty leaves on those she encounters throughout the world. Angela Kelly has the rather modern role of Personal Assistant to the Queen. Within this remit she not only provides insights into life in the wider world for HM but also reigns supreme in the Aetelier of Buckingham Palace. Our queen along with several other Royal women in Europe has the clothes crafted to best meet her needs by her own personal staff who know, better than almost any designer could, what would suit her needs for the role that she performs. Angela's remit covers Jewellery, Insignia and Wardrobe, she's not alone as she works within a team of 4 women supporting the Queen but her's is the leading voice in the quorum of women supporting Her Majesty and it's Angela who has taken up the mantle of carrying on the reigns of fashion from the Queen's trusted Couturiers, most notably attending audiences the Queen held with the late Hardy Amies to glean some of his craft. From 2002 Angela has been Head Girl in the Queen's wardrobe moving from Liaison with Couturiers to actually designing and making the clothes herself. Along with the very able, not to be forgotten Alison Pordum she tackles the needs of the Queen with a lot of forethought, care and planning. The Queen's show piece dress featured in the Olympics Opening Ceremony was created from materials kept in the cloth archeive for many decades. Angela and her team in fact created 2 dresses to be used by the Queen as she dramatically jumped out of the Helicopter with James Bond into the Olympic Stadium. Angela is, of course led in all her work by the wishes of Her Majesty. The Queen gives guidence on the need to be noticed and stand out in the crowds of people who come to see her. One thing Angela has revealed is the Queen's strength in her own judgements. She has a life long knowledge of fashion in the public eye and is very well aware of what would work best in what environment. When she wants something she will ask for it, such as the Shamrock embroidered dress for her historic trip to Ireland earlier this year. As always it was a hit 100% spot on. V&A Ballgowns Exhibition. British Glamour since 1950. In Association with Coutts. The V&A launched it's much heralded Ballgowns exhibition. This showcase of British Couture was one of my highlights this Summer. There is a feast of contemporary British Design worn by some of our favourite fashion figures over the last few decades. In particular the famous feathered dress from Daphne Guinness' collection by Alexander McQueen that transformed her into a fashion Swan. The exhibition charts the life of the Ballgown in modern times showing it's place in Society and relevance to our lives today. (C) Angela Cliffe 2009 -2013.